This two-week-long movement/visual art installation features Eiko & Koma’s exploration of nakedness, desire, and the elasticity of time. Eiko & Koma will be on continual view in a hand-crafted environment of their design, in closer proximity to the audience than ever before. Audiences may come and go as they wish – or stay all evening. 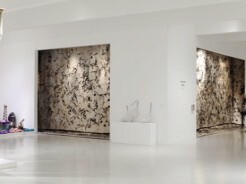 Naked was commissioned by the Walker Art Center and premiered there in November 2010. This event is part of Carnegie Hall’s citywide JapanNYC Festival and is presented in partnership with Asia Society and Danspace Project.